Rheumatoid arthritis is a type of chronic (ongoing), autoimmune arthritis that causes inflammation (pain and swelling) of the joints in the body. 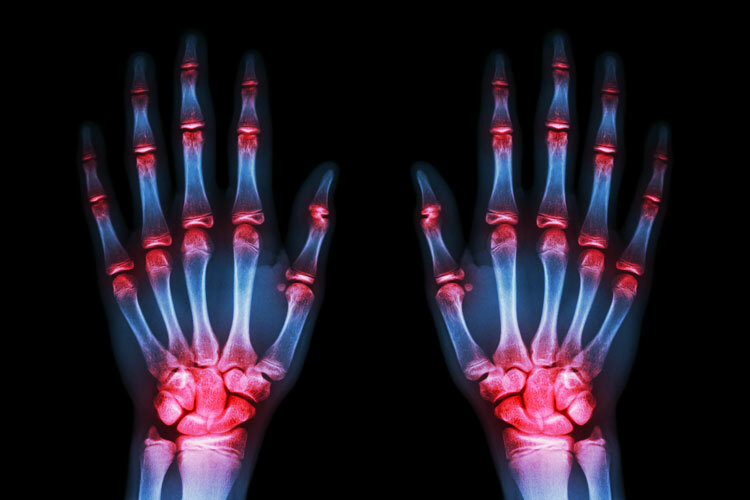 Joints commonly affected by rheumatoid arthritis (RA) include the hands, wrists and feet. These joints are usually affected in a symmetrical pattern – joints are inflamed on both sides of the body at the same time. In addition to affecting the joints, RA is known to affect organs of the body including the skin, eyes, lungs, heart, blood and blood vessels. Rheumatoid arthritis is 3 times more common in women than men and is most commonly diagnosed in middle aged or older people. However, RA can affect people of any age. Rheumatoid arthritis usually starts slowly and often begins in small joints, such as in the fingers and toes. Many people with RA experience disease ‘flares’ (times when the symptoms are worse than normal) and remissions (periods when symptoms improve). Some people may have only one attack, or flare, of rheumatoid arthritis in their lives. In some people, RA symptoms may be constant and progressive, and in some it may progress rapidly. Permanent joint damage can result from RA, but joint damage can be limited when RA is diagnosed and treated early. Rheumatoid arthritis is an auto-immune condition, which means that it results from your immune system being overactive and attacking and damaging your own healthy tissue. In RA, the immune system attacks the membrane lining your joints (the synovium), resulting in inflammation. Over time, this inflammation can lead to cartilage and bone erosion and joint damage and deformity. Your doctor will ask about your symptoms and perform a physical examination. Several tests may be recommended, including X-rays of affected joints and blood tests. Diagnosis is usually decided by considering a combination of the following factors. The specific location of the painful and tender joints and whether they affect both sides of the body (called symmetry). The presence of stiffness and pain in the joints in the morning. The presence of bumps and nodules under the skin (called rheumatoid nodules). Results of X-rays that may show inflammation or damage to the joints. Positive results of certain blood tests. Blood tests that can help diagnose rheumatoid arthritis include anti-cyclic citrullinated peptide (anti-CCP) antibodies and rheumatoid factor. However, these are not conclusive tests because the tests are not positive in all people who have rheumatoid arthritis (false negatives). In addition, rheumatoid factor is sometimes detected in people who do not have rheumatoid arthritis (false positives). Many people with rheumatoid arthritis will be referred to a specialist called a rheumatologist. eye problems such as dry eyes or eye inflammation. People with rheumatoid arthritis may have problems with depression and anxiety, especially if they have significant joint damage. Although there is not yet a cure for rheumatoid arthritis, with the help of your doctor and rheumatologist, you can manage it by taking steps to decrease the pain and inflammation of the condition. Early diagnosis and treatment of rheumatoid arthritis improves the long-term outcome. improve function and quality of life. There are some self-help measures that may help you manage the symptoms of rheumatoid arthritis. A balance of rest and exercise is important. When there is a worsening of the joint pain and inflammation, rest is recommended and you may need to use a walking cane or joint splints. When the inflammation decreases, gentle exercise (such as walking or swimming in heated pools) is needed to maintain mobility in the joint, prevent stiffness and to strengthen the surrounding muscles. Take simple painkillers (after checking with your doctor). Apply heat or cold packs. If you are overweight, losing weight can help reduce some of the strain on your joints. Eating a healthy diet will help. Stop smoking if you are a smoker – smoking has been linked to poorer responses to treatment and worse outcomes. Join a support group. Support groups can help you talk to other people with the same condition who can provide advice, understanding and support. There are arthritis support groups in every state in Australia. Monitor the progress of your disease. Prescribe medicines. Prescription medicines for rheumatoid arthritis include anti-inflammatory medicines, strong painkillers and special medicines; however, you need to have regular check-ups with your doctor to ensure that there are no problematic side-effects. Recommend surgery to reduce pain, correct deformities and improve function of the affected joints. A physiotherapist can provide treatment to relieve pain and stiffness, improve joint movements and strengthen muscles. An occupational therapist can help if you have been disabled in any way by the condition and are finding it hard to cope with daily activities and tasks. Occupational therapists can help organise aids to help you if joint damage is causing you difficulties in the home or workplace, for example difficulties dressing, writing, bathing or cooking. 1. Arthritis Australia. Rheumatoid arthritis (updated May 2015). http://www.arthritisaustralia.com.au/images/stories/documents/info_sheets/2015/Condition%20specific/Rheumatoidarthritis.pdf (accessed Mar 2016). 2. National Institute of Arthritis and Musculoskeletal and Skin Disease. Rheumatoid arthritis (August 2014). http://www.niams.nih.gov/Health_Info/Rheumatic_Disease/ (accessed Mar 2016). 3. Singh JA, Saag KG, Bridges SL, et al. 2015 American College of Rheumatology Guideline for the treatment of rheumatoid arthritis. Arthritis Care & Research (Hoboken) 2016 Jan;68(1):1-25. http://www.rheumatology.org/Practice-Quality/Clinical-Support/Clinical-Practice-Guidelines/Rheumatoid-Arthritis (accessed Mar 2016).